With 40 illustrations. This is a short survey of Greek religious practice and beliefs. 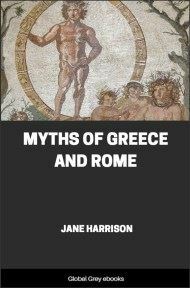 It gives a fascinating look at the very earthy popular side of Greek religion, with its festivals, initiations, secret societies, oracles, and a practical but very superstitious belief system. 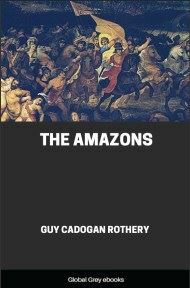 The author also discusses how some of these beliefs and festivals, under the guise of Christianity, have persisted to this day. Greek religion in its various aspects has been the subject of numerous investigations. Modern research has progressed along two lines especially, the search for primitive survivals and the study of the literary expressions of religion. The first is attributable to the rise of the science of anthropology since the seventies of the last century. 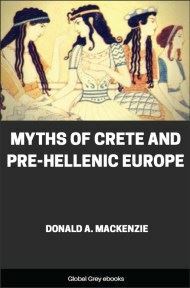 In this science the study of Greek religion, viewed as a direct development from a primitive nature religion, has always taken a prominent place. I need only mention the names of Andrew Lang, Sir James Frazer, and Jane Harrison. While it is true that there were very many relics of primitive religion in Greek religion, it must be remembered that Greece was a highly civilized country and that even its most backward inhabitants were subject to the influence of its culture. It is misleading, therefore, to represent Greek religion as essentially primitive. The primitive elements were modified and overlaid by higher elements through the development of Greek culture. They were survivals and must be treated as such. 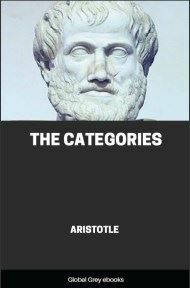 The second line of research has been pursued by philologists, who, quite naturally from their point of view, found the highest and most valuable expression of Greek religious thought in the works of the great writers and philosophers. I may recall the names of such men as Lewis Campbell, James Adam, and Wilamowitz-Moellendorff. The philologists neglect or impatiently brush aside the popular aspects of Greek religion as less valuable and less well known. It is true that the religion of the masses was on a lower level than the religious ideas of eminent literary men, but it is also true that those ideas made hardly any impression on the development of Greek religion. The writers were not prophets, and the philosophers were seekers of wisdom, not of religious truth. The fate of religion is determined by the masses. The masses are, indeed, susceptible to high religious ideas if they are carried away by a religious genius, but only one such genius arose in Greece, Plato. Even he wished to be regarded as a philosopher rather than as a prophet, and he was accepted as such by his contemporaries. The religious importance of his thought did not come to the fore until half a millennium after his death, although since that time all religions have been subject to his influence. I should perhaps mention a third kind of inquiry which has been taken up by scholars in recent years, especially in Germany. 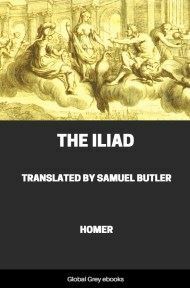 Their endeavors cannot properly be called research, however, for they have been directed to the systematizing of the religious ideas of the Greeks and the creation of a kind of theology, or, as the authors themselves express it, to revealing the intrinsic and lasting values of Greek religion. To this class belong, among others, W. F. Otto and E. Peterich. The great risk they run is that of imputing to the Greeks a systematization such as is found in religions which have laid down their creeds in books. The Greeks had religious ideas, of course, but they never made them into a system. What the Greeks called theology was either metaphysics, or the doctrine of the persons and works of the various gods. It is of the greatest importance to attain a well-founded knowledge of Greek popular religion, for the fate of Greek religion as a whole depended on it. It is incorrect to say that we have not the means to acquire such knowledge, for the means are at hand: first, in our information about the cults in which the piety of believers expressed itself; second, in hints by the writers of the classical period; and third, in archaeological discoveries. As I have stated, we ought not to mistake the popular religion for the primitive elements, which persisted in great measure but were subject to and influenced by the development of Greek civilization and political life. In beginning my exposition of Greek popular religion I want to draw attention to a point of primary importance. In the latter part of the archaic age and in the classical age the leading cities of Greece were more and more industrialized and commercialized. Greek civilization was urban. 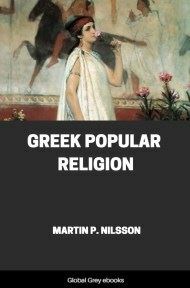 Many parts of Greece, however, remained in a backward state, and while they are of no importance in the history of civilization and political life, they are important in the history of religion. For they still preserved the mode of life which had been common in earlier times, when the inhabitants of Greece were peasants, compelled to subsist on the products of their own country--the crops, the fruits, the flocks, and the herds. In trying to understand Greek popular religion we must start from the agricultural and pastoral life of the countryside, which was neither very advanced nor very primitive culturally. The Greek peasant usually lived in a large village. Many ancient cities with names familiar in history were but villages similar to those found in Greece today. Let us imagine a Greek peasant. He rose early, as simple people always do, before dawn. In the dusk of the morning he looked for the stars which were beginning to wane above the eastern horizon, where the growing light announced the rising of the sun. The stars were for him only indications of the time of the year, not objects of worship. He greeted the rising sun with a kiss of the hand, as he greeted the first swallow or the first kite, but he did not pay it any reverence. He needed rain, and sometimes cool weather, more than he needed the sun. He looked at the highest mountaintop in the neighborhood. Maybe it wore a cloudcap. This was promising, for up there on the top of the mountain sat Zeus, the cloud-gatherer, the thrower of the thunderbolt, the rain-giver. He was a great god. He had other aspects of which we shall hear later. The roar of the thunder was the sign of his power and presence--sometimes of his anger. He smote the high mountains, the tall oaks, and occasionally man with his thunderbolt. But the flash of the lightning and the roar of the thunder were followed by the rain, which moistened the soil and benefited the crops, the grass, and the fruits.